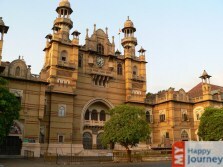 Also known as Vadodara, Baroda is a prominent city of Gujarat. Sited on the bank of River Vishwamitri, this was a princely state till the time of independence. The city offers a whole lot of options to travelers to add to their itinerary. These include majestic historical sites, novel industries and modernized IT parks. The city has got the honor of being considered as the cultural capital of Gujarat. The city proudly flaunts a number of places in its vicinity. Some of the palaces which will keep you engrossed on your visit to the city are Pratap Vilas Palace, Nazarbaug Palace, Laxmi Vilas Palace and the Makarpura Palace. Among all, Laxmi Villas is the hot favorite among tourists for its rambling ground and amazing architectural work. Museums and gardens are the main attractions of these palaces. Some of the museums which have the finest collections from the past era are Maharaj Fateh Singh Museum, Baroda Museum and Picture gallery and many others. The three main gardens which will leave you spellbound are Lal Bag, Sayaji Bag, and Sardar Bag. Apart from these, some other places of Baroda which are worth a visit are Aurobindo Ashram, Kanderao Museum, Hazira Maqbara, EME Temple, Mandvi City, Kala Goda and Nyay Mandir.